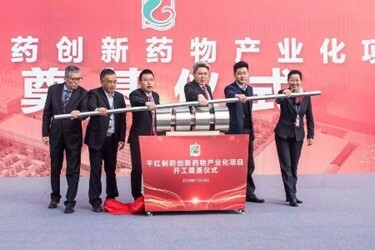 Changzhou, China /PRNewswire/ -- Changzhou Qianhong Bio-pharma Co., Ltd. started construction of the phase two of pharmaceuticals production facility at Changzhou National Hi-Tech District on November 28. With an investment of 1 billion yuan, phase two adds 200 million tablets and 60 million injections to production as well as making molecular diagnosis reagents available for use by 20 million people. Changzhou government officials including Liang Yibo and Yan Jun took part in the groundbreaking ceremony.